First flight of SDD JSF Prototype AA-1 in December, 2006. This aircraft is a 'non-representative prototype' which predates a series of structural and systems weight reduction measures. The aircraft is equipped with a dummy EOTS fairing under the nose (Imagery via Air Force Link). The Joint Strike Fighter program is in serious difficulty. This paper performs a longitudinal assessment of progress on the program over the last three years, focussing on the series of annual GAO progress assessments, and publicly documented development problems observed during the SDD. From a project management perspective, the JSF is showing all of the symptoms of a program which is in serious difficulty. The slippage of schedules, the migration of capabilities across Blocks, the nature of the development and test problems observed over the last year, and the failure of the program's managers to institute a transparent and deep audit of progress and risks across the program are all typical of the “textbook” warning signs of trouble which are taught in any university level technical and project management class. No less concerning is the incessant flow of public relations material produced around the program, much of it clearly designed to focus observers away from the more important fundamental problems. 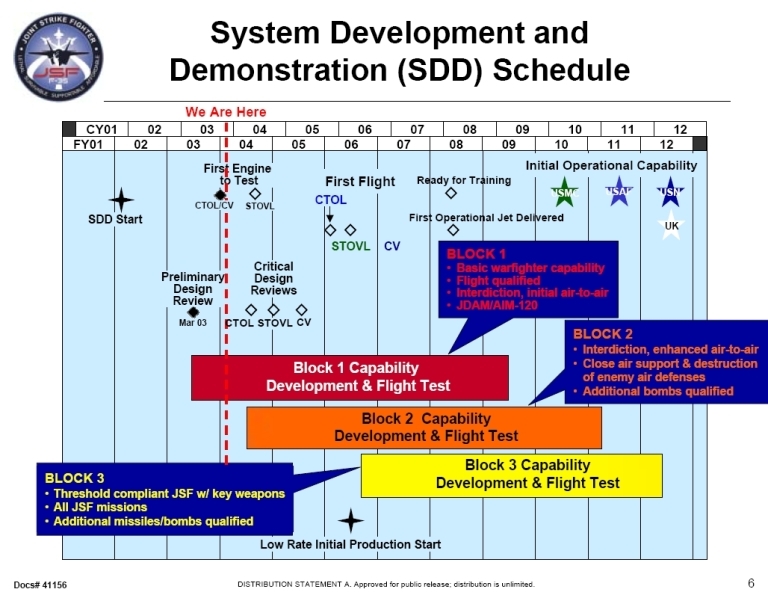 The problems we are observing in the JSF SDD are a direct consequence of five encumbrances built into the program from the outset, these being specifically the use of concurrent production and development; the attempt to reconcile the diverse and often divergent needs of four primary end users; the excessive use of immature new technology in the design; the use of the non-viable CAIV (Cost As an Independent Variable) philosophy in development; and finally the concurrent public relations and marketing campaign designed to minimise transparency of project progress and internal integrity, thus hindering or delaying externally imposed corrective measures. Analysis of the F-35 Joint Strike Fighter program remains as challenging as ever, due mainly to the intensity of the marketing and public relations effort which pervades every aspect of the program. However, the last twelve months have seen a number of important developments, many of which can be subjected to scrutiny. Given the ~US$300B planned expenditures on this program, program marketing to partner nation politicians and the public has continued to exert a major influence on the program, generally at the expense of internal oversight and hard critical analysis of the state of actual progress. The latest problem to surface is one additional year's delay expected to be added to the SDD Phase of the program as a result ongoing difficulties in development. This delay came to light early May this year in the Netherlands' press (De Volkskrant, 10th May), when Defence Minister De Vries was challenged in the Dutch parliament over difficulties with the program. De Vries disclosed that a 'rescheduling' and a 'one year extension' of the SDD effort was discussed during the JSF International Steering Committee meeting in April, and intended to be announced later this year. The timing of this announcement is significant insofar as it would put the media backlash to a further delay into the period immediately following the US Presidential poll, when the media will be preoccupied with US election results. In Washington major developments centre upon a series of highly critical GAO (Government Audit Office) reports, especially the report released March last year (GAO-07-360). The GAO is the US equivalent to the Australian National Audit Office. The JSF Program departs from recent US acquisition practices. The US DoD abandoned concurrent development and production acquisition strategies during the 1970s and has adopted since then a rigorous approach centred on extensive testing before funds are released for subsequent activities. Under this model a developmental design has to be proven before Low Rate Initial Production (LRIP) funding is released, and LRIP production examples have to pass a tough operational evaluation, before Full Rate Production funding is released. 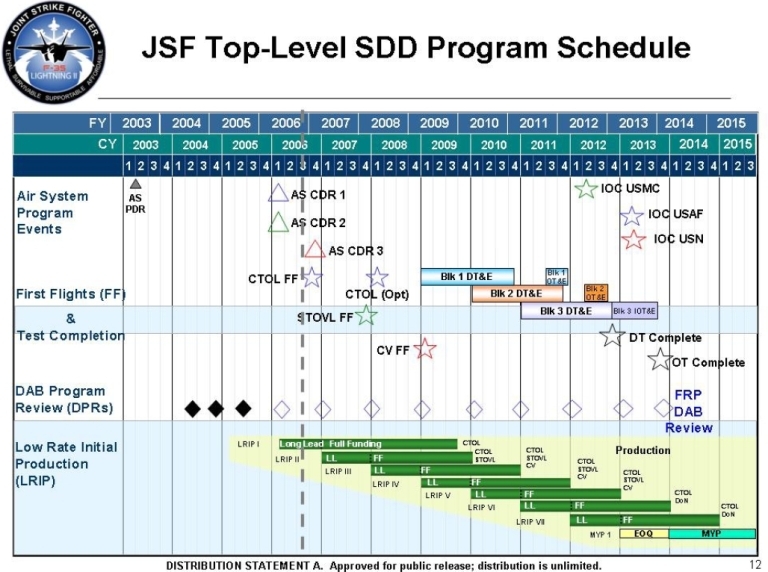 However, the JSF Program is following a very different model, as it is being allowed to progress into the LRIP phase while only a small percentage of the total mandated flight testing has been performed, while there have been ongoing delays in testing and development activities. Given the program's established track record of design problems, creeping delays and cost overruns, it was therefore no surprise for analysts when the latest GAO report (GAO-08-388) focused again on costs and especially unresolved risks. What was most unusual is that the Pentagon JSF program office publicly criticised the auditors' report in the media, alleging that the GAO cost analysis were not correct, despite the GAO pointing out that documentation of costs in the program was problematic and presented difficulties in performing analysis. 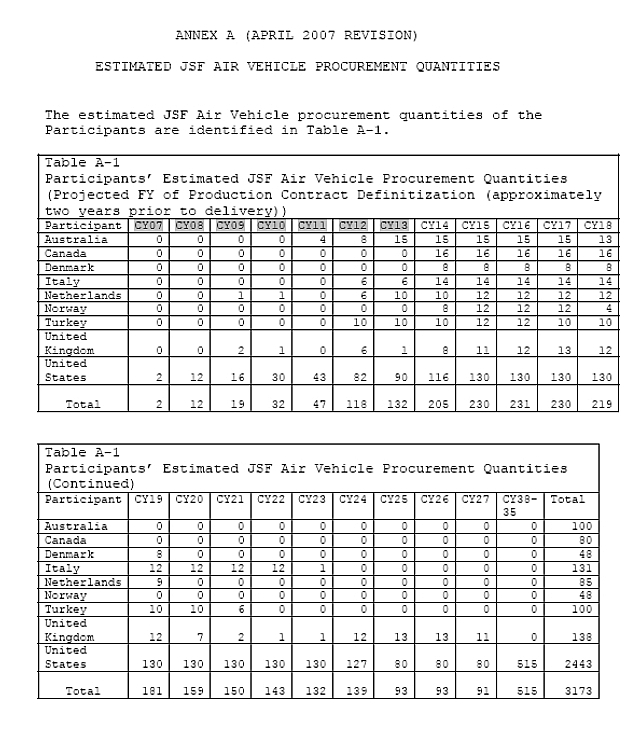 The GAO further pointed out that cost per flight hour for the JSF had exceeded the figure for the F-16, a benchmark for low cost fighter operations. 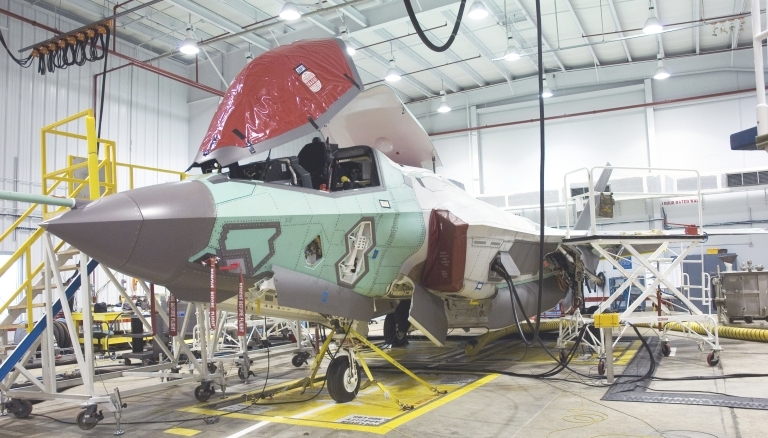 Much of the GAO's ongoing concern about the JSF Program revolves around the nexus of cost and risk. Every risk which materialises adds to costs, and usually adds further delay to Initial Operational Capability (IOC). To date only a small fraction of the mandatory testing has been performed, leaving a great many unknowns or uncertainties in the domain of performance, capabilities, reliability and flight safety. What has fuelled the GAO's fears about the program has been the ongoing series of difficulties encountered during the SDD, many of them symptomatic of poorly managed design and project management processes. The saga of the weight reduction effort is a good example, as early in the SDD it was established that the airframe with systems installed was too heavy to perform, a critical definicency for the STOVL variant. This was followed by the SWAT (STOVL Weight Attack Team) effort intended to drive the weight of the design back to an acceptable number. The SWAT effort was followed by a major public relations campaign declaring publicly that the weight problem had been beaten. When the published target weight data for the JSF variants is tracked over time, it is clear that empty weight remains a major design problem. Between 2002 and 2006, the weight of the CV variant grew by 6.7%, the STOVL variant by 8.2% and the CTOL variant by 9.6%. An aircraft which is 10% over its empty weight target will see that 10% come out of disposable weapons payload in combat, or manifest through inevitable performance penalties across the board, especially in range or agility. 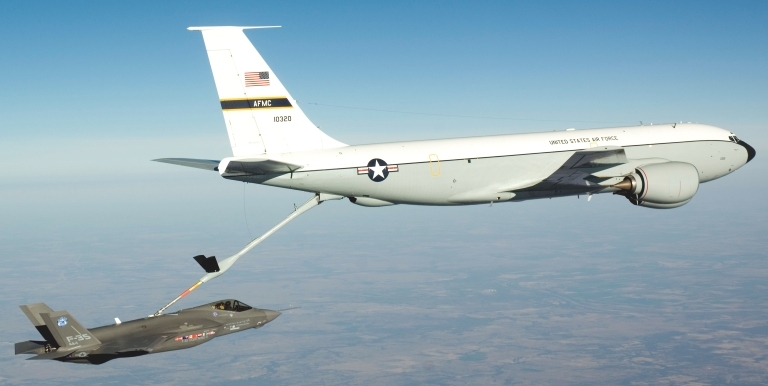 This is not a trivial matter since in a aircraft with a combat weight of ~40,000 lb, 10% excess weight translates to ~4,000 lb, which for a JSF sized aircraft is of the order of its nominal internal bomb payload, or ~20% of its internal fuel payload. If weapons and fuel are retained, the 10% comes out of Specific Excess Power, to the detriment of performance. In the longer term, the aircraft will end up without growth potential over its operational life, particularly in regard to space, engine and electrical power, and equipment cooling capacity. The redesign effort resulting from these weight problems has delayed flight testing considerably, as the much publicised first SDD flight test vehicle does not represent the LRIP airframe configuration in performance terms, and can thus be used only to flight test systems. There are other factors of concern in regard to capability in this program. 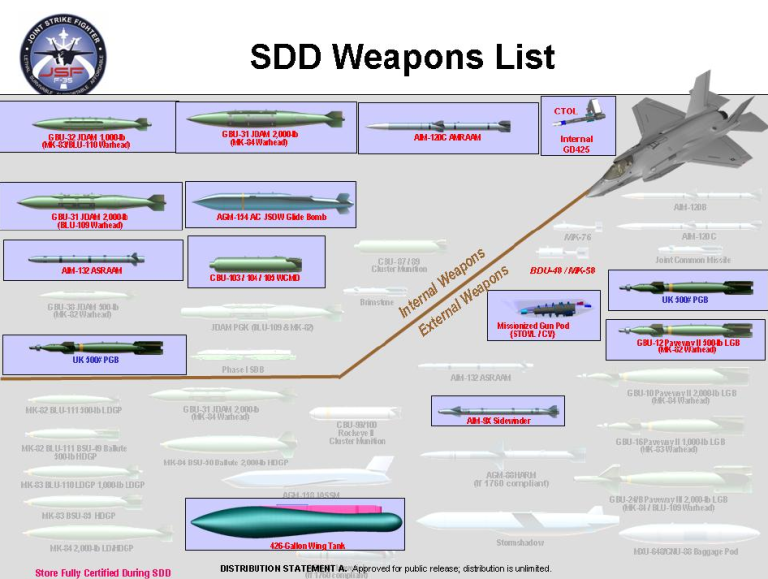 One is the progressive slippage in capabilities planned for each production Block of the design, following the progressive stripping of many weapons clearances out of the SDD and into production phase spiral development. Tracking the presentation slides showing planned weapons clearances is an enlightening experience. 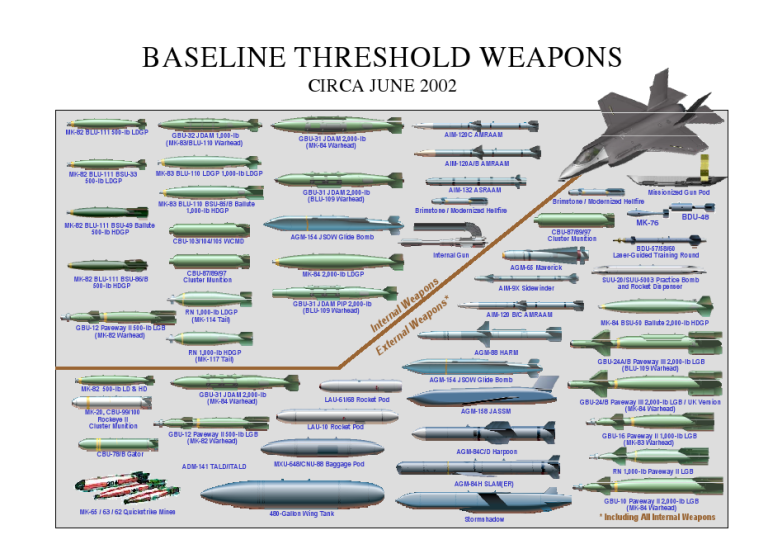 2001 Baseline SDD Threshold Weapons. 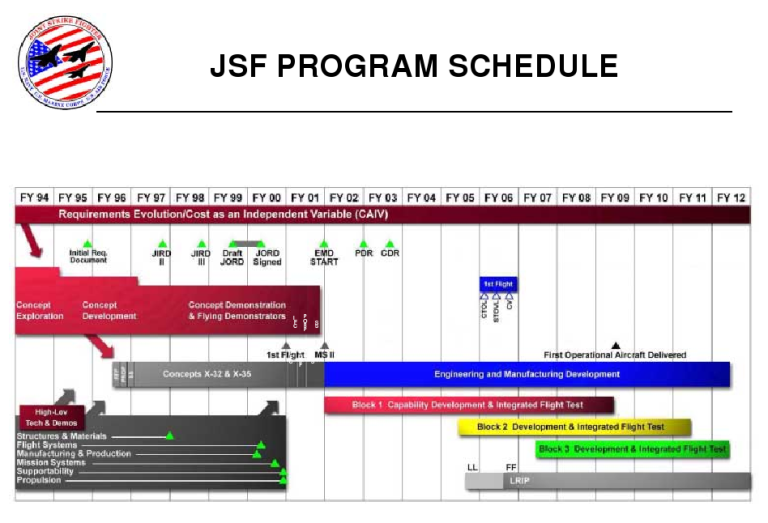 A worthwhile comparison is the planned breakdown of capabilities against JSF production blocks, for 2006 and 2008. In June 2006 the capabilities of Block 1 “Initial Warfighting Capability” were defined as “Flight qualified, baseline air-to-air and air-to-ground weapons qualified. Pilot and maintenance training can commence”. 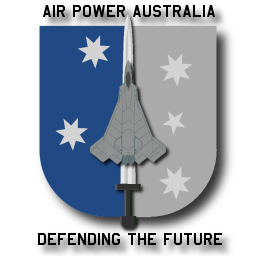 In May 2008 the capabilities of Block 1 were defined as “Support for AI [Air Interdiction] mission (limited target set), allowing meaningful operational test.” Thus, over the last two years the Block 1 aircraft lost its air-to-air capability and its strike capability has been restricted. In June 2006 the capabilities of Block 2 “Close Air Support and Interdiction” were defined as “Qualifies additional air-to-air and air-to-ground weapons. Services can start planning deployments and staffing operational units”. In May 2008 the capabilities of Block 2 were defined as “Added support for CAS with expanded target set (sensor detection and weapon prosecution).” In effect, over the last two years the Block 2 has been constrained to what appears to be less than the capability of the earlier Block 1. In June 2006 the capabilities of Block 3 “Suppression of Enemy Air Defences” were defined as “Qualifies additional air-to-air and air-to-ground weapons for use. Service Initial Operational Capabilities are acheivable”. In May 2008 the capabilities of Block 3 were defined as “Follow-on build to incorporate advanced decision aids, threshold weapons, and limited objective functionality.” Similarly, the Block 3 falls clearly well short of the IOC capabilities package marketed so actively in 2002. 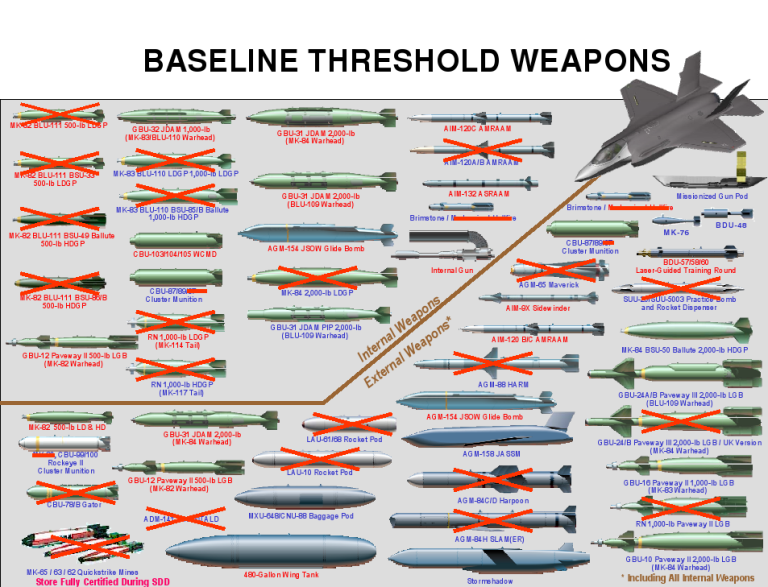 What we see here is a well established trend of reducing the aircraft's capabilities planned for each block, with a resulting concurrent slippage of capabilities as a whole. The open question, assuming the program achieves IOC, is what the actual capabilities of the IOC aircraft will be. Conspicuously, air to air capabilities are not particularly visible in the 2008 definitions. The problems observed with weight and the clearly limited success of the weight reduction effort have been paralleled by other problems in early testing and design validation. Several are notable. The F135 engine gearbox had to be redesigned and requalified to deliver the additional power required to drive the uprated generator, this power produced in turn at the expense of available engine thrust. F135 engine prototypes have experienced failures of the driveshaft, and an October 2007 test forced a shutdown, the cause claimed to be cracking of a third stage low pressure turbine blade. The F135 turbine runs much hotter than any earlier engine, so if this becomes the cause of a reliability or durability problem, it will have to be derated at the expense of thrust performance. What is especially concerning about these problems is that they are all in areas which are flight critical, and from a system design perspective, they impact power / weight ratio in a design which is patently underpowered and overweight. 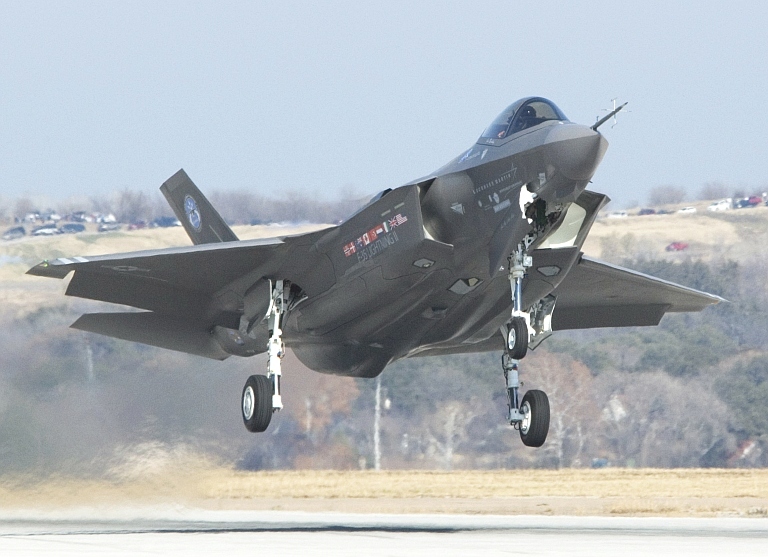 The F-35B STOVL variant is critically dependent upon achieving the necessary thrust to weight ratio to perform a vertical recovery with reserve fuel and a “bring back” weapons payload. 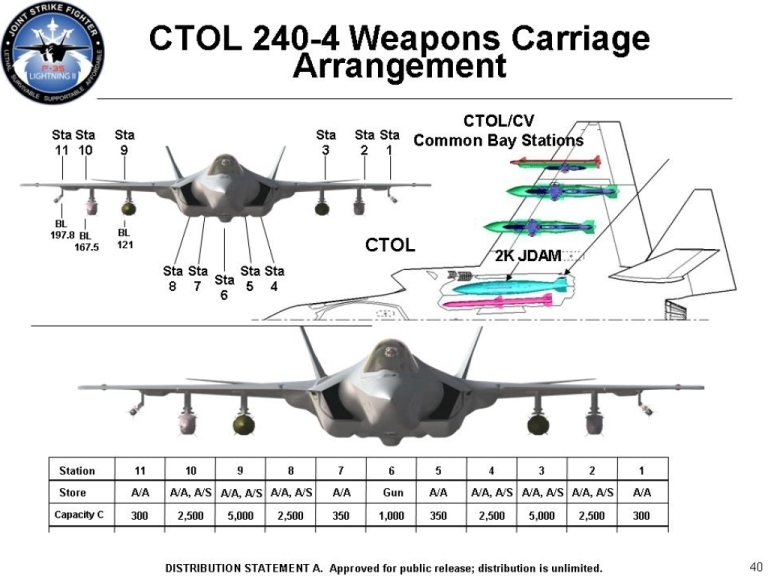 Delays to the CATB airborne systems integration testbed will in turn delay critical testing and validation of the JSF software, the most complex in any fighter to date. The undersizing of the F-35C generator begs some serious questions about the basic integrity of the design process employed in the SDD, as it is a fundamental design consideration and one which should never “slip between the cracks” during product development. As all experienced design engineers know, one of the first tasks in any design process is to identify and pin down the critical performance constraints for key systems or design components. Evidently this did not occur in the design of the JSF electrical system, for reasons never properly explained by the project office or manufacturer. In designing and developing an aircraft intended to provide a generational edge, many risks will inevitably arise. The resulting, almost inevitable, cost and schedule impacts can, within limits, be accepted, but only so long as the design continues to demonstrate a high probability that the aircraft will meet or exceed its prime specification requirements. In the case of the JSF, the contrary has been demonstrated time and again, establishing a solid trend of increasing delays and declining capabilities. From a project management perspective, the JSF is showing all of the symptoms of a program which is in serious difficulty. The slippage of schedules, the migration of capabilities across Blocks, the nature of the development and test problems observed over the last year, and the failure of the program's managers to institute a transparent and deep audit of progress and risks across the program are all of the typical “textbook” warning signs of trouble which are taught in any university level technical and project management classes. No less concerning is the incessant barrage of public relations material produced around the program, much of it clearly crafted to focus observers away from the more fundamental issues. Attempting to conduct a concurrent production and development program, despite a history of repeated failures which have been observed in such programs. Attempting to merge the disparate requirements and needs of several services into a single design to force commonality, yet again a practice which has historically failed to work well, and typically results in unreasonable expectations and unrealistic design compromises. Attempting to infuse too many items of immature and often very new technology into the design, such as electrically powered controls, a new class of cockpit design, unprecedented software complexity, a new engine design, and a new generation of radar technology. The use of the Cost As an Independent Variable (CAIV) philosophy, whereby capabilities are traded to achieve cost targets, and which is an inherent logical fallacy in complicated performance sensitive system designs. A concurrent public relations and marketing campaign designed to minimise transparency of project progress and internal integrity, thus hindering or delaying appropriate and timely externally imposed corrective measures. Whether the JSF can survive the handicaps it was brought into the world with remains very much an open question. United States Government Accountability Office, Testimony Before the Subcommittee on AirLand, Committee on Armed Services, U.S. Senate, Tactical Aircraft: F/A-22 and JSF Acquisition Plans and Implications for Tactical Aircraft Modernization, GAO-05-519T, URL: http://www.gao.gov/htext/d05519t.html , accessed May, 2008. 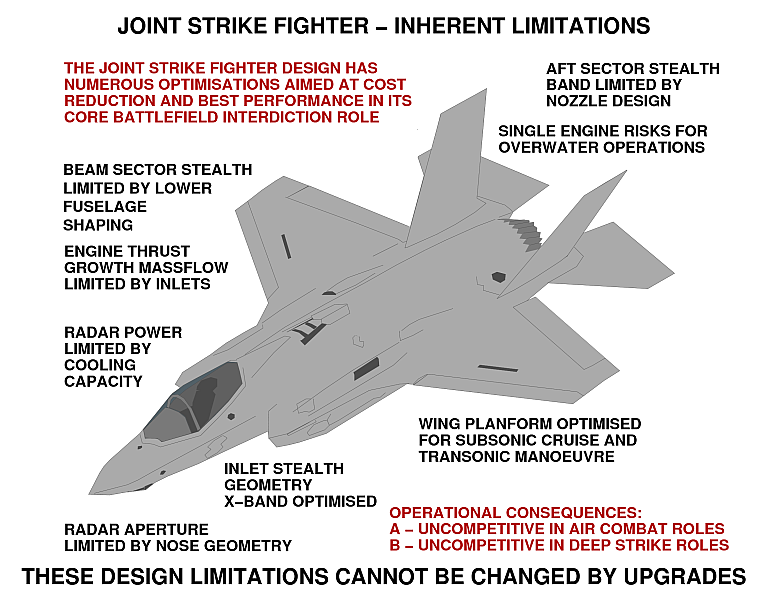 United States Government Accountability Office, Report to Congressional Committees, JOINT STRIKE FIGHTER: DOD Plans to Enter Production before Testing Demonstrates Acceptable Performance, March 2006, GAO-06-356, URL: http://www.gao.gov/cgi-bin/getrpt?GAO-06-356, accessed May, 2008. United States Government Accountability Office, Testimony before the Subcommittee on Tactical Air and Land Forces, Committee on Armed Services, House of Representatives, Tactical Aircraft: Recapitalization Goals Are Not Supported by Knowledge-Based F-22A and JSF Business Cases, March 2006, GAO-06-487T, URL: http://www.gao.gov/docdblite/info.php?rptno=GAO-06-487T, accessed May, 2008. United States Government Accountability Office, Report to Congressional Committees, Joint Strike Fighter: Progress Made and Challenges Remain, March 2007, GAO-07-360, URL: http://www.gao.gov/cgi-bin/getrpt?GAO-07-360, accessed May, 2008. United States Government Accountability Office, Report to Congressional Committees, JOINT STRIKE FIGHTER Recent Decisions by DOD Add to Program Risks, March 2007, GAO-08-388, URL: http://www.gao.gov/cgi-bin/getrpt?GAO-08-388, accessed May, 2008. Roy E. Rice, CAIV…NOT!! !, Military Operations Research Society, Alexandria, VA, URL: http://web.archive.org/web/20051026114032/www.mors.org/publications/phalanx/feb00/Caiv/caiv.htm, accessed May, 2008. Peter Goon, The Biggest Loser, APA NOTAM #1, 16/04/2007. Bill Sweetman - Aviation Week - 13/05/08 - JSF, More Delays, More Money, accessed May, 2008. F-35 Lightning II Joint Strike Fighter Program, URL: http://www.jsf.mil/, accessed May, 2008. Spangenberg G.A., Naval Aviation Planning, A Retrospective View, The Gold Book of Naval Aviation, 1985 Edition, The Association of Naval Aviation, Wings of Gold Press, Falls Church, Virginia, USA (Recommended).